Transitions are a constant in our lives. Time after time, we find that the old maps don’t work, and we must reach deep into our spiritual resources to find the guidance we need. 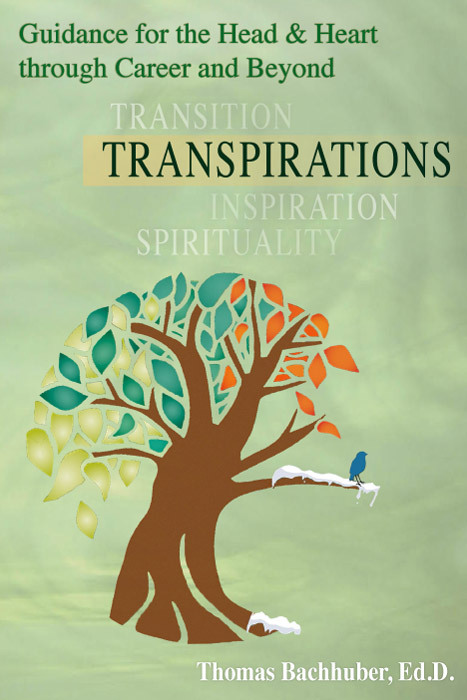 “TranSpirations”—transitions inspired by the spirit—is what Tom Bachhuber calls these passages, and he should know. For decades he has been helping people make their transitions in a life-giving way, moving beyond fear to faith on to solid ground. The illustrations in this book, some from Tom’s own life, are real and compelling, and the exercises he recommends are immediately helpful. The reader soon learns that he or she is on pilgrimage with a good and grounded man, not on a “magical mystery tour” with a flighty spinner of tall tales. I recommend this book for all who are seeking to take their next turn in life in a way that responds to the imperatives of their souls. Parker Palmer is the founder and Senior Partner of the Center for Courage & Renewal, which oversees the “Courage to Teach” program for K-12 educators across the country and parallel programs for people in other professions, including medicine, law, ministry and philanthropy. He has published a dozen poems, more than one hundred essays and eight books, including: Healing the Heart of Democracy: The Courage to Create a Politics Worthy of the Human Spirit, A Hidden Wholeness: The Journey Toward An Undivided Life, and Let Your Life Speak: Listening for the Voice of Vocation. Palmer’s work has been recognized with thirteen honorary doctorates, two Distinguished Achievement Awards from the National Educational Press Association, an Award of Excellence from the Associated Church Press, and grants from the Danforth Foundation, the Lilly Endowment and the Fetzer Institute. What a superb book Thomas Bachhuber has created. This marvelous, balanced book contains a combination of mind and spirit, the wisdom from Tom’s personal experiences and the insights of other authors, spirituality for inspiration and practicality for activation. This book flows like a river, carrying encouragement and hands-on application for readers to identify the issues, go deeper, become clearer, set goals, and stay hopeful. I highly recommend this book to anyone experiencing career or retirement transitions. Sister Joyce Rupp, O.S.M., is an award-winning author who is also a retreat and conference speaker. She is the co-director of The Institute of Compassionate Presence, a member of the Servite Order, and a volunteer for Hospice. Her books include: Walk in a Relaxed Manner, Circle of Life, and Little Pieces of Light among many others. Thomas Bachhuber brilliantly develops William Bridges’ three stages of transition, Endings, Middles, and Endings into the three chapters of TranSpirations. Tom’s book is an authentic call to be mindful, hopeful and confident of God’s presence in making such transitions for our careers and work. Tom shares several journal entries for significant ending, middle and beginning times in his personal and professional life. Tom then shares his own reflections and presents the voices of many theologians, poets, philosophers, Biblical characters and persons seeking new work in order to inspire and remind us of ways to build our own wisdom, voice and courage for our own work transitions. Whether I read a chapter at a time or open the book to random parts, I am humbled by Tom’s honesty and vulnerability in his journal entries, inspired by his reflections for work, and both challenged and affirmed by his guidance for pondering and discerning the next things I can do. TranSpirations is helping me to look at myself and others in new loving and courageous ways especially when fear, impatience or quick fixes are involved. I am developing new language, networks and possibilities when I am frustrated and skeptical. I am learning to act from gratitude and other healthier parts of my being when I am taking my next steps in my career. Dr. Bob Pavlik serves as the Executive Director of the High Wind Foundation which funds partnerships for sustainability, applying his areas of expertise in literacy, learning and community development for the Sustainability Movement. He has taught graduate courses at the University of Northern Colorado and Cardinal Stritch University where he also served as Director of Faculty Development. For the last 15 years, he directed the School Design and Development Center and the Project for Community Transformation at Marquette University. Tom Bachhuber has written an excellent resource for people making important transitions in life. He has done so by employing a multi-level approach of the professional, the psychological, the personal (his own life transitions of illness and loss), and finally, the spiritual. It is rare to find a work that incorporates all such levels, especially the spiritual. The latter is most significant in that it provides the wisdom and faith to sustain us in what is often a challenging but ultimately rewarding process. Dr. James Flaherty is Pastor at Gesu Church, the Jesuit parish of Marquette University and former Professor in the Marquette University Philosophy Department. He is a member of the Board of Trustees of Marquette University and Santa Clara University. I recommend TranSpirations as a unique resource which can be highly effective as a companion to traditional job search books. Tom has utilized the well respected William Bridges model in creating a unique framework connecting the abstract—spirituality—with the pragmatic—job search. His writing offers an intriguing combination of heartfelt personal experiences related in a fashion that projects wisdom, insight and humor together with very useful advice on the career transition process. Tom’s distinctive dualistic approach conveys the message to the reader that there are no “quick fixes” to the transition process, but that it is conceptually a part of life’s inner journey. Chuck Hays is a retired Vice President, Right Management Consultants, Inc. the world’s premier career transition firm. He has extensive experience in coaching executive, managerial and professional level individuals in the areas of career strategic planning, re-employment and entrepreneurship and retirement planning for over thirty years. I heartily endorse this book as a tool for anyone in a career transition. Students in college looking to the future can especially excel from using this engaging read and story based text which prompts very important questions they each need to address. The book is invaluable for those feeling stuck in decision making, and a perfect aid for necessary reflection and getting to the next step. The process by which you use this resource is a skill development forming tool in and of itself. Translating one’s academic background, and personal experiences, and skills all lead to the dream career when these insights develop and take hold. A definite read for all college to career, new or experienced career entrants, no matter the field of interest. No Google search will give you the answers this book can lead you to. Tom shares from the heart in this one of a kind resource combining multiple dimensions of who we are and what we believe, to get us to our next venture. Denise is Assistant Vice President for Alumni and Career Services at the University of Richmond. Previously she was the Director of the University Career Center at the University of North Carolina at Charlotte for 20 years. She has presented, consulted, and published nationally and internationally (Japan, Germany, and England) in the field as well as participated in television news features on job market and recruiting and dual career family issues in Philadelphia, Dallas, Chicago, and Charlotte. In gratitude to Tom Bachhuber for beautifully and creatively bringing together the wisdom of his counseling and career development career and the wisdom of his spiritual journey. In doing so, Tom has modeled a method of reflection that draws on listening without (to the expertise and wisdom of others) and listening within (to the promptings of the soul and the voice of God). As a spiritual director, I especially appreciate Tom’s dedication to his own interior life and his willingness to share its ebb and flow so openly. Reading TranSpirations is like having a spiritual conversation with a beloved friend. It will draw you in, take you deeper and leave you feeling connected. In short, it is an experience of great love for anyone going through a transition. Monica Meagher is currently serving as Spiritual Director at the Faber Center for Ignatian Spirituality, Marquette University. She is also Regional Director for Ignatian Volunteer Corps Milwaukee, providing volunteer and spiritual opportunities for retired adults. Do not just read this book! Prayerfully ponder it. I was initially overwhelmed by the importance of this project and the wealth of its rich resources; let the creative genius of this effort and its prayerful process work its transformative power upon you! Tom Bachhuber invites you to take a personal, spiritual, transformative journey with him. No matter where you are on your career or life journey, this book will speak to your mind and heart and guide you through life’s inevitable transitions of Endings, Middles and Beginnings. This book is unique in this way: it provides a rich, personal, vulnerable faith component as its integrating factor. Touched by the wisdom and practicality of Ignatian spirituality, Tom Bachhuber uses personal life experiences, questions and wisdom words to guide and help you reflect on and integrate your own life experiences. Eugene F. Merz, S.J., a Jesuit priest, has offered spiritual direction and retreats based on the Spiritual Exercises of St. Ignatius and given Ignatian spirituality workshops around the world for laity, priests and religious men and women. He and Carol Ann Smith, SHCJ are the authors of Moment by Moment: A Retreat in Everyday Life and Finding God in Each Moment: The Practice of Discernment in Everyday Life. “For when I am weak, then I am strong.” (2 Corinthians 12:10) This bedrock of Christian faith has challenged and comforted me throughout my life. Because of Tom Bachhuber’s thoughts, writings, and counseling, this staple to a tranquil life has become much clearer. When one grows close to a friend during the formative college years, it makes a lasting impression. Adult life provides the inevitable ups and downs related to family, health, and job challenges. I have been blessed with an “old and new friend” who values wisdom, depth, and the courage of his convictions. Tom’s humility and understanding shines brightly in his writing. Tom possesses an uncommon way of looking at the joys and sorrows of life. His insight is grounded in faith, meditation, relationships, and realistic optimism. Tom’s very personal approach to professional, individual, and family transitions is inspirational while being practical and spiritual at the same time. The apostle Paul advised us in Romans, 12:12 to: “Rejoice in hope, be patient in tribulation and constant in prayer.” Paul provided the blueprint for Tom’s masterful look at what is genuinely important in life. Jack is a highly successful retired high school and college basketball coach, elected to the Wisconsin Basketball Coaches Association Hall of Fame in 2006. As head coach at the University of Wisconsin-Stevens point, he led the Pointers to back to back national championships in 2004 and 2005. He is a frequent speaker throughout the region and takes great pride in integrating his Christian faith into his professional, educational and volunteer work. I am pleased to provide this endorsement for Dr. Tom Bachhuber’s remarkable new book TranSpirations: Guidance for the Head & Heart Through Career and Beyond. In a highly unique approach, Dr. Bachhuber uses his personal experiences with love and loss to help the reader reflect on their own experiences and how these can be used to bring meaning to one’s own life in times of personal or career transition. This book is extremely practical for anyone seeking a new career opportunity, contemplating the next chapter of their life, or going through a major transition, ones’ own or that of a good friend or family member. Most career books focus strictly on the techniques of job search and don’t deal with the all-important emotional side of facing voluntary or involuntary career transition or making important life decisions. In TranSpirations, Dr. Bachhuber skillfully uses journaling as a vehicle for learning from difficulties we all face in life. He takes a positive view of the curve balls life throws, encouraging the reader to gain strength from losses and mistakes, to be positive when faced with adversity, to learn from challenges. In career/work transitions for example, he has reflections on successful networking, the importance of goal setting, dealing with disappointment, inviting multiple perspectives, tapping into one’s personal strengths, and paying attention to non-verbal cues when communicating with employers. These and many other concepts in the book will help anyone who is navigating a difficult work environment, seeking meaningful work, contemplating their next chapter, or helping a friend manage similar challenges. Karen is Assistant Dean, Career Management and Corporate Engagement at Simon Business School, University of Rochester. She was formerly Executive Director of Career Services and Corporate Engagement for the Daniels College of Business at the University of Denver. has co-authored two books, The Ultimate Guide to Getting the Career You Want, and Interpersonal Skills in Organizations, both published by McGraw-Hill. This book is a beautiful and inspiring integration of Tom’s personal experiences, reflections and insights from favorite spiritual writers and poets, and the wisdom and guidance needed for navigating life’s transitions, especially toward work that provides meaning and purpose in one’s life. The work is a masterful reflection on the lessons and wisdom that flow from life’s joys and sorrows, dreams and challenges – all from a perspective of high hope for new beginnings no matter what they might be or when they might occur over the course of one’s life. The connection Tom makes between his personal experiences — serious illness, the loss of his parents, and the birth of his first grandchild – and the experiences of job hunters and career changers are both insightful and helpful. A hidden gem lies concealed in the Appendix. Twenty-two Random Ideas on Making Successful Career/Work Transitions is worth its weight in gold to anyone in the midst of a career transition. Jim is the retired Executive Director of the School of Applied Theology and former Executive Assistant to the President and Vice President of Student Services at Santa Clara University. Prior to his five years at SAT and his 22 years at SCU, Jim was Director of Career Planning and Placement at the University of California Berkeley and Georgetown University. Jim’s present ministry includes coaching and workshop leadership on spirituality and purposeful aging. Dr. Thomas Bachhuber is President of the Board and Executive Director of The Center for Life Transitions, Inc. His LifeSHIFT: Work & the Christian Journey weekend retreat is offered throughout the country, combining career/work/retirement planning with spiritual exploration. He is on the leadership team for the Ignatian Volunteer Corps-Milwaukee, providing volunteer service opportunities and spiritual formation for retired adults. Tom was Director of the Career Development Center at the University of Maryland-College and University of Wisconsin-Milwaukee. As a consultant, he led training, research and recruitment initiatives for several Fortune 500 companies. Besides TRANSPIRATIONS (Caritas Communications), Dr. Bachhuber has published Directions: A Guide to Career Planning (Houghton-Mifflin), When Your Son/Daughter Plans for the Future: A Guide for Parents (Abbey Press) and The Best Graduate Business Schools (Simon and Schuster). Tom’s Doctorate and Masters in Counseling are from the University of Virginia. He earned a B.A. from Ripon College. He and Leslie have been married for 47 years and have three adult children–Libby, Emily and Jay and one grandchild, Oona Mae.